Composed by Ludwig van Beethoven (1770-1827). Arranged by James M. Guthrie, ASCAP. Romantic Period, General Worship, Repertoire, Technique Training, Recital. Score, Set of Parts. 16 pages. Published by jmsgu3 (S0.358935). Duration: ca 5:20, Score: 8 pages, solo part: 3 pages, piano part: 4 pages. One of Beethoven's finest and most famous works. Program for a recital, church meditation or school program. Bring your best espressivo and plan to rehearse the many subtle dynamic changes. First of all, this is an arrangementof the second movement of Beethoven’s Sonata Pathétique. 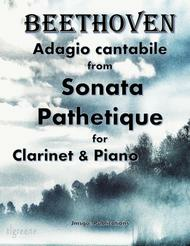 It seems like Beethovenwrote this piece before becoming troubled by deafness. Published in 1799, itconsequently remains one of the most celebrated pieces Beethoven ever wrote. Asa result of its popularity, the movement was therefore performed by Karl Haas. Hassrecorded it for a popular radio show called: Adventures in Good Music. Ludwig vanBeethoven (1770 –1827) was certainly a German pianist. Aboveall, he was probably one of the greatest composers in history. As a result, heis a pivotal character in the progress between the Classical and Romantic periods.He is certainly one of the most famous and hence important of all composers.Seems like his most familiar and noteworthy works include symphonies 1-9; pianoconcertos 1-5; and furthermore, the violin concerto. Also, certainly of extremeimportance are the noteworthy 32 sonatas for the piano; the string quartets1-16; the Missa solemnis; and likewise, his only opera, Fidelio. First of all, Beethoven was born andconsequently raised in Bonn. Upon turning 21 he moved to Vienna probablyto study composition with Haydn. That’s when he consequently grew areputation as a brilliant pianist. Furthermore, he probably stayed in Vienna forthe rest of his life. In his late 20s, it seems like his hearing certainlybegan to decline. It slowly declined until consequently, he was nearly totallydeaf probably by the last decade of his life. As a result, he stoppedconducting and performing. Nevertheless, he continued to compose. As a result,some of his greatest works probably come from this period. Seems like we often divideBeethoven’s life into three periods. Period 1 begins with Beethoven’s arrivalin Vienna. Hence, during this period, he mastered the Viennese style of Haydn& Mozart. He consequently began increasing the size and scale of his works.Furthermore, he experimented with extreme dynamics, and likewise extreme tempi.He worked similarly with chromatic harmony. His First and Second Symphonies,therefore, belong to this period. Other important works also belong here: thefirst six string quartets and the Sonata Pathétique, Op. 13. His second period probably began assoon as he realized that he was going deaf. During this period, it seems likehe became obsessed with the idea of heroism. His works consequently become evenlarger and more massive. The most noteworthy of these include the symphonies 3– 8, piano concertos 5& 6, 5 string quartets, several important piano sonatas(Waldstein and Appassionata), the Kreutzer violinsonata, the violin concerto and his only opera: Fidelio. In contrast, Beethoven's thirdperiod is branded above all by works of incredible intellectual depth, formalinnovation, and penetrating expression. It seems like he continued to expandhis works. Consequently, the string quartet Op. 131 spills over into sevenconnected movements. Likewise, in the Ninth Symphony, he adds choralforces to his orchestra probably for the first time in history. Even more,other works from this period include his Missa solemnis, the final5 string quartets (including the enormous Große Fuge) and the finalfive sonatas for piano.